After working hard on your DIY project the last thing you want to do is choose the wrong finish for that final touch. There are a few varieties of polyurethane, and while everything comes down to personal preference there are some common usages where one type of poly is preferable to another. Trying to decide which polyurethane is right for your DIY project? Here are some points to consider. Water-based polyurethane is ideal for indoor use on everything from furniture to photo frames. It’s popular with DIYers since it’s lower in toxicity than oil-based polys, plus it offers easy clean-up. 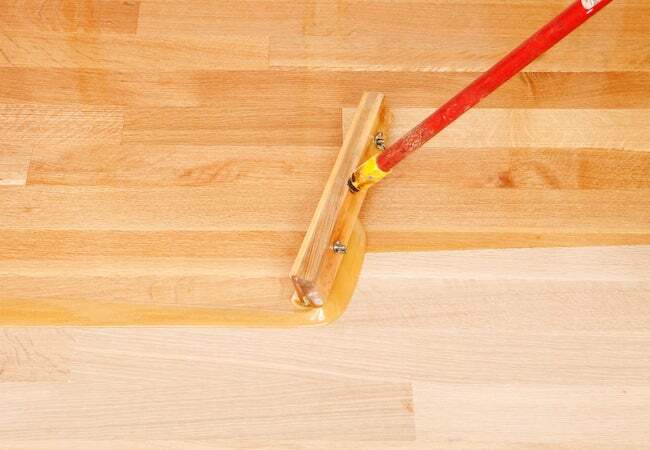 The newer water-based oil-modified polys offer a bit more protection than straight water-based products, and are commonly used on hardwood floors. However, they’re more prone to cracking and peeling if exposed to heat and sunlight, so for outdoor applications you’re better off with a traditional oil-based product. Though oil-based polys are more durable in hot and sunny locations, they’re also higher in toxicity and no fun to clean up. Still, if you don’t mind those drawbacks, oil-based polyurethanes produce a protective and subtle, amber tint that will show off the underlying grain of most any wood you’re working with.